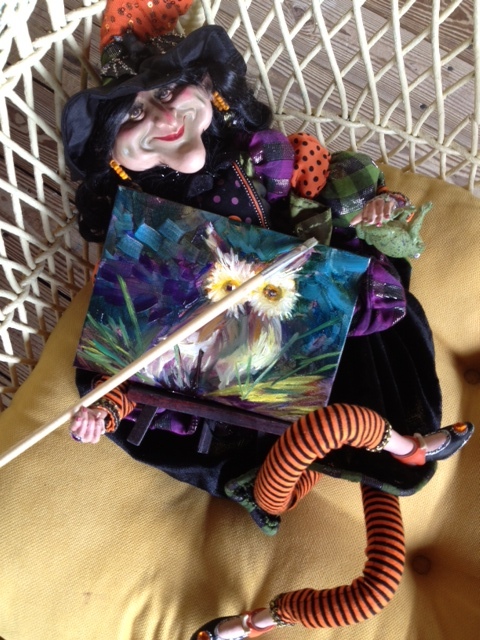 I know it’s a big leap from angels to witches, but that’s how I roll…..or at least that’s the artist coming out in me. But never fear, my angels are by my side. 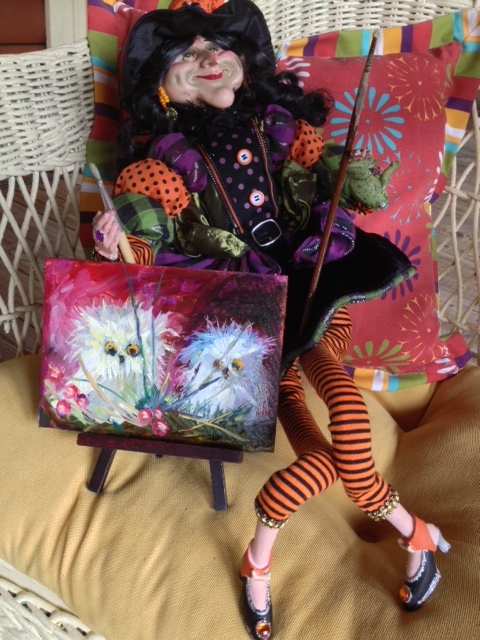 I bought this gorgeous colorful witch from a unique gift shop in Elizabethtown, yes, you guessed it…….Smellie Bloomers, oh how I love that beautiful shop. Michelle and Kelly go the extra mile to make it a gorgeous eye-stopping showplace. Next time you are in Elizabethtown, you just have to stop there, or come see me and I’ll take you there! Any hoooot, I saw a few owls in the shop too and they inspired me to paint a few feathery creatures, and my new witch helped! Let me know what you think……….oh, by the way, it’s time to draw for another free Kathy Surprise, will post by the end of the week and my new owl paintings will be for sale at Smellie Bloomers by Friday….they are fresh off the easel this morning! Aren’t her shoes cool too? Love me some shoes! Mrs. Bunn, you owl picture is to cute!!! The witch is to cool. Hope your doing good. So going to have to see ya one of these days when I am down at my moms. Yes, I agree with Marilyn… just really enjoy seeing everything new that you’re inspired to do! I wish I could think up something fun to paint and have it turn out so cute! Love all your beautiful paintings. We never know what this talented artist will paint next. <|:) love it…if the broom fits…ride it!